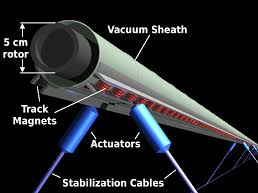 This solution proposes that payloads might be launched into space by means of magnetized cables that are contained in sheaths. 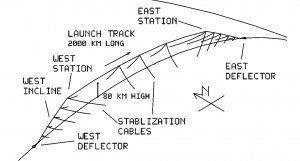 240 miles), suspended above the atmosphere by the momentum of a flat belt that will be circulating around the entire structure. In effect, the momentum of the circulating belt would transfer the mass of the structure to a pair of supporting magnetic bearings at each end of the loop.